Alejandro Herrera is from El Paso, Texas, and began his dance training at Ballet Austin while attending the University of Texas, eventually Majoring in Theatre & Dance. After attending Summer Programs with American Ballet Theatre he moved to New York to study Ballet at Manhattan Youth Ballet (formerly Studio Maestro) under Deborah Wingert, Daniel Ulbicht, and Francois Perron. He has also studied at Ballet Academy East and The School at Steps where he trained privately with Leslie Browne, former Principal Dancer with ABT and star of “The Turning Point.” He has previously performed in Dances Patrelle’s “Yorkville Nutcracker” and as a guest artist with El Paso Conservatory of Dance. 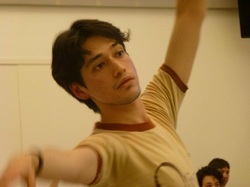 More recently he was accepted as a Trainee with Los Angeles Ballet and Ballet Hispanico Dos.